Hello. Thank you for all your sweet visit and messages. The tulips that I picked up at the grocery store a few days ago have started to open, and they are so pretty to look at. I have not tried growing them from bulbs here, but I know that I would have to refrigerate them, because it doesn't get cold enough. Just a couple of days ago they were completely closed. For awhile I had them on the dining table today, because the bucket is another one of my small projects in progress, and I'm enjoying the bucket's softened sheen. I softened its sheen a bit by laying in on the ground in the yard and spraying it with vinegar and sanding it with steel wool a number of times. Undiluted vinegar. 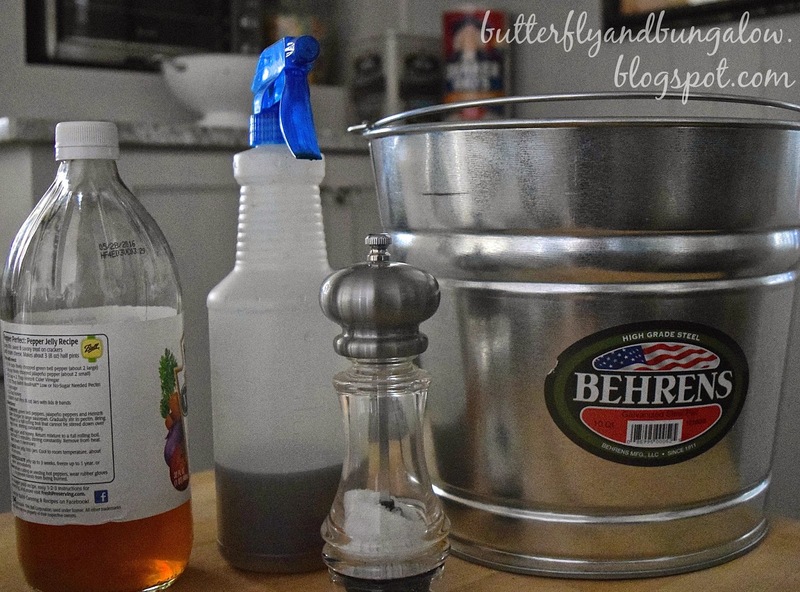 Vinegar is not that strong of an acid, and it will probably help kill any weeds it hits. If I want to distress it more, it will take a bit more work, because it is a high quality bucket made in the USA, and I don't want to use anything toxic. Oh, and since the kitchen is small, the chair covers are our everyday look in our dining room, the are handmade and they came from Ticking and Toile and the color is perfect. (It doesn't show anything.) Earlier in the week I showed them on chairs at our study table on the sleeping porch. It was a bit shiner to begin with. We also made gluten free oatmeal cookies today with dried cranberries, and my daughter helped me with the photos. They are simple to make and even simpler if you use oat flour by taking your oats and grinding them in the blender. But I didn't feel like cleaning the blender, so I used rice flour. My daughter liked them this way better, though I like the oat flour. 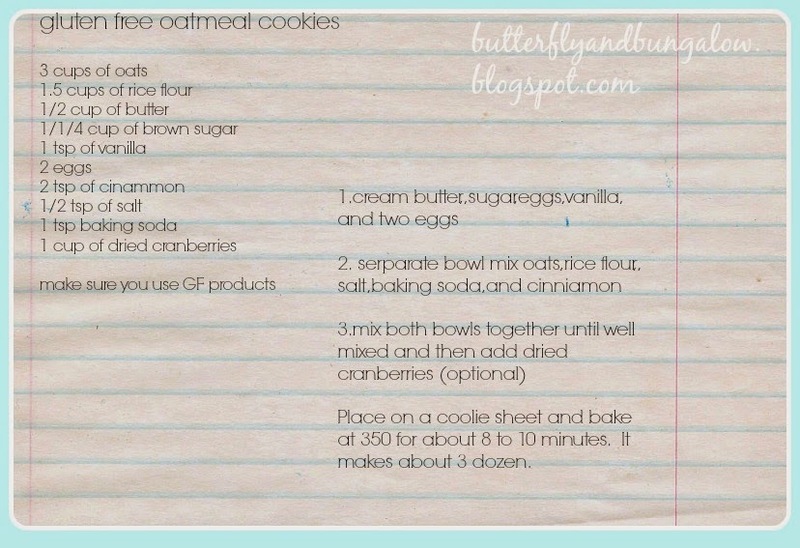 Here's the recipe: just make sure to use gluten-free products if someone has celiac. Some oats are processed in plants that process gluten products. Oh how I love tulips!!! Love them in that huge bucket, too. Enjoy your cookies!! Thank you, Anne. They are so pretty, I wish they grew here. Such lovely tulips! I was unable to grow them when I lived in Phoenix but am going to try my hand at planting some bulbs here in the fall. I love your chair covers. Did you make them? Oh Su...I just adore the colour of those tulips! They are such happy flowers, aren't they? And you displayed them beautifully on your table too! Happy New Week. Love your tulips. I am on my way for my first outing to the grocery store. I want to get some fresh flowers too to brighten things up. The cookies sound so yummy. Thank you, Kris. Fresh flowers will help. Have a wonderful weekend. Tudo tão lindo e cheio de vida! Your tulips have a very beautiful colour. So elegant. Love the way you watering them! The tulips have an amazing colour, so deep! I love tulips. They are such a happy flower, so symbolic of spring far more than any other flower. Yum those cookies look good! Will have to try the recipe! 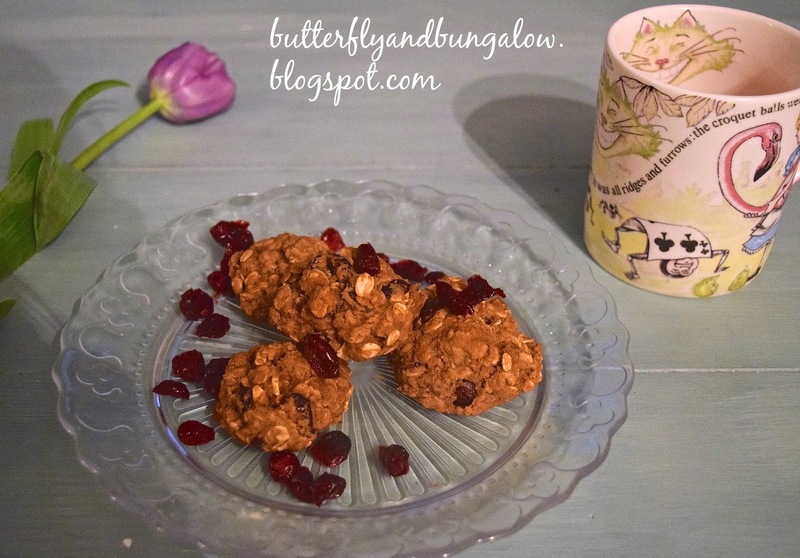 Oatmeal are one of my 2 top favorite cookies but since I'm OK with gluten I use the flour but the dried cranberries is a sensational idea. Thanks. Loving your purple tulips are they open their petals. 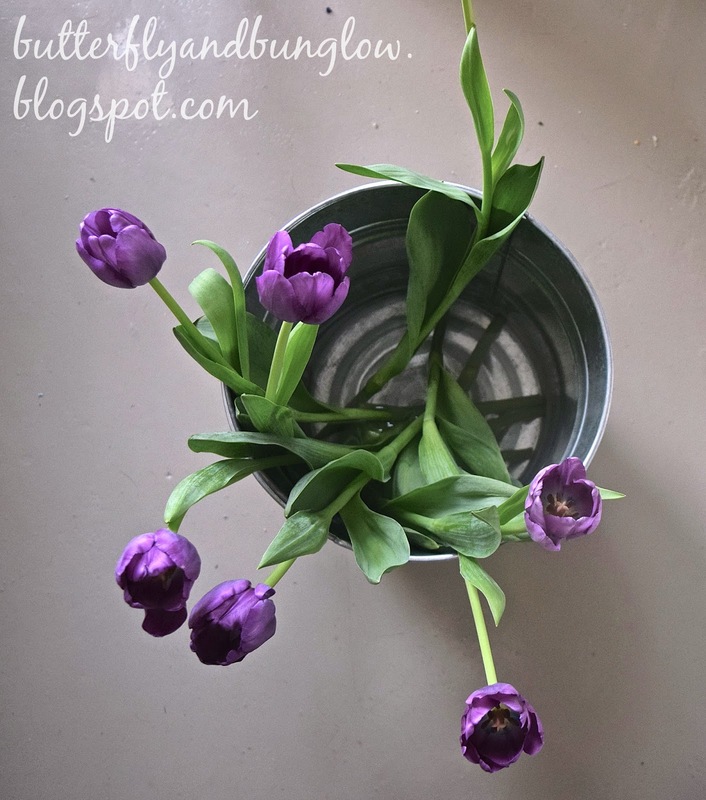 Another blogger offered a tip on one of her posts that dropping a penny into the water will keep tulips from drooping although I like them drooping. I usually use my rustic French flower bucket but recently John had stopped into our corner hardware store and picked me up a bucket just like yours. I thought it was too shiny ... So from the bottom of my heart thank you Su for the tip on aging. I'm going to do it. I meant as not are, sorry! 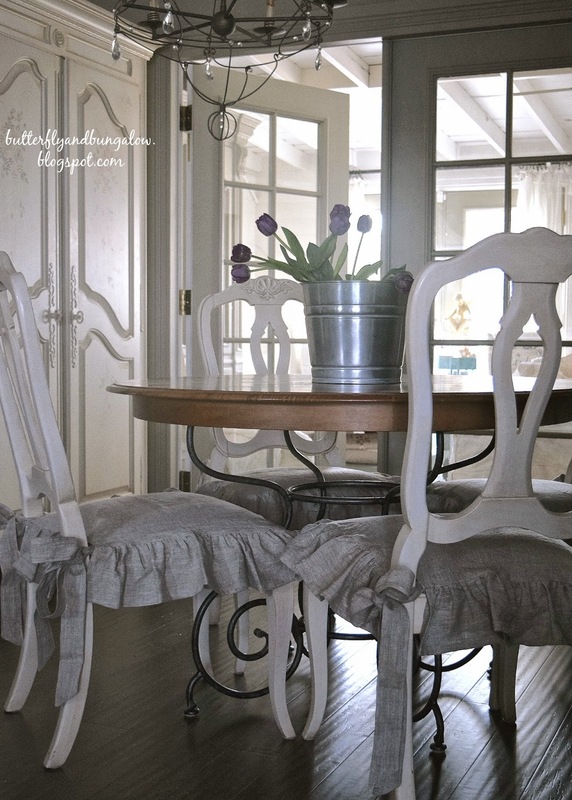 Your dining room is so pretty from this angle with the french doors. I look forward to trying the recipe. We love oatmeal cookies. Thank you, Kerrie. I'm so glad we put those in. Someone in the 70s installed a slider. It was a super heavy door and super clear like real glass. We were never sure if it was tempered, so we had someone take it out. Good thing we did, it was mortared to the brick. I love the colour of your tulips. And I will definitely be trying that delicious recipe! Thank you, Sarah. I use less butter than usual, but she likes to have it for breakfast with milk sometimes, so they are a little bit healthier version. Not too sweet either, for example granola is much sweater than these. I am on the road for work right now but when I get home I am going to pick up some supermarket tulips. I absolutely adore them!! Hi, Donna. Tulips are so pretty and happy looking. Those purple tulips look especially nice in the silver pail. Are you putting them in the fridge overnight? I've heard that is a good way to extend the life of tulips. Thank you for sharing the recipe. I love tulips and purple is a favorite color. Your pictures are wonderful. Have a nice upcoming weekend. Thank you, Mildred. Tulips don't grow here, and I thought it was such a beautiful shade. It is more like a breakfast cookie, it's not as sweet as granola. My daughter likes to have them for breakfast sometimes. Tulips are one of my favorite flowers too-I just treated myself to a small blue hydrangea plant...happy, happy. Hydrangeas are so pretty, and I can't grow them here either. The tulips are so pretty, great colour. That's interesting that you would have to refridgerate the bulbs, don't have that problem in Ireland!! I do have very heavy wet clay and so I grow them in pots so they don't rot. At least you can source them, it's so nice to have them in the house in Spring. As always I love your photos. Thank you, Poppy, I followed you back as well. Oh my gosh, that top photo took my breath away, just beautiful! Thank you, Gigi. Have a wonderful weekend. It does look like we better enjoy it! Absolutely gorgeous, and thank you so much for the recipe. The shade of purple with that rustic bucket look amazing together! Now I feel the need to run to the grocery store for tulips! Thank you, Roselle. They still look pretty even today.Have a wonderful weekend. Your photos are always so beautiful. LOVE the tulips in the bucket! Thank you for sharing the recipe...looks yummy. What a gorgeous color! I can't grow tulips here, as the deer love them and munch them right to the ground! Thankfully they don't touch my daffodils:) Your dining chairs are gorgeous!! Love! I am never able to find them at the grocery store here (in South Texas). I have never cooked with almond flour. Thank you for the recipe. I love tulips too. but I never see them in my yard because the rabbits get them just before they bud! I love rabbits but wish they would find other food. So I always buy them because it is a great way to celebrate that spring is finally here, finally. Always looking for a gluten free cookie recipe. What flour do your use, or do you make your own? Great tulip pictures and great recipe. Lover everything with cranberries in it. 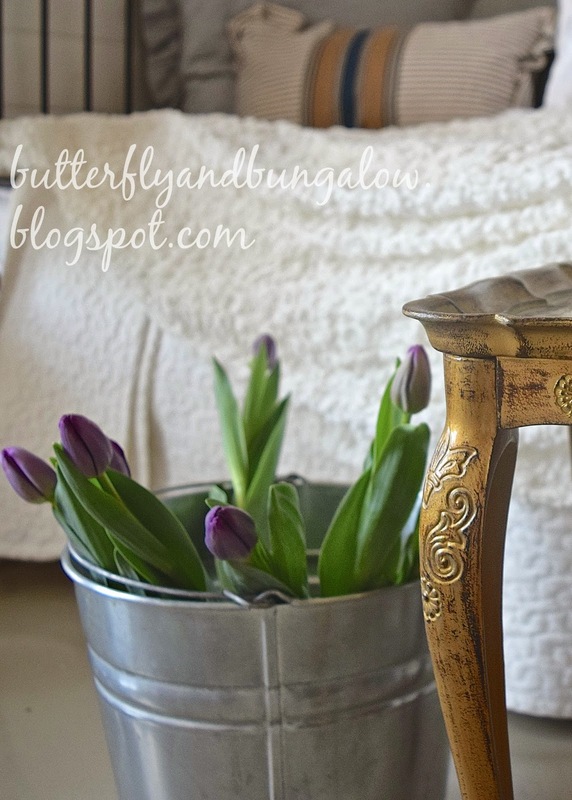 Your pretty purple tulips are perfect in their new place of residence, and styled superbly! ahhh, those are beautiful tulips..and the bucket is adorable. I didn't know how to age buckets...and pots...thanks for the tip. the sleeping porch is so pretty! love those purple tulips!! Thank you, Amalia. It gets warm early there too! Tulips are such pretty flowers and I love how beautiful they look in the bucket. I liked them on the table, too because your dining room is so warm and welcoming. I love the color of your tulips and thanks for sharing this cookie recipe. Baking is fun & taking photos with your daughter! Have a wonderful week!